In one of the previous articles we have described the installation of a WSUS server on Windows Server 2012 R2 / 2016 in details. After you have configured the update server, you need to configure Windows clients (server and workstations) in order to use the WSUS server to receive updates. Thus, all Windows clients on your network should receive updates from the internal update server, and not from Microsoft Update servers via the Internet. In this article, we will take a look on how to configure clients to use a WSUS server using Active Directory domain group policies (GPO). AD Group Policies allow the administrator to automatically assign computers to different WSUS groups, thus the WSUS administrator won’t have to manually move computers between groups in the WSUS console and keep these groups up-to-date. Assigning clients to different target WSUS groups is based on a label in the registry on the client (labels are set by a GPO or a direct registry modification). This type of client assigning to the WSUS groups is called client side targeting. It is expected that our network will use two different update policies: separate update policy for Servers and another one for Workstations. These two groups need to be created in the WSUS console in the All Computers section. Tip. The policy of using the WSUS server by clients depends largely on the organizational structure of the Active Directory organization units (OU) and update installation rules in the company. In this article we will try to understand the basic principles of using group policies to install Windows updates. First of all, you have to specify the rule of grouping the computers in the WSUS console (targeting). By default, the computers in the WSUS console are distributed into groups manually by the server administrator (server-side targeting). It does not suit us, so we are going to specify that the computers are to be distributed into groups using the client side targeting (using the group policies or registry parameters). To do this, in the WSUS console click Options and open Computers. Change the value to “Use Group Policy or registry settings on computers”. Now you can create a GPO to configure WSUS clients. Open the Group Policy Management (GPMC.msc) and create two new group policies: ServerWSUSPolicy and WorkstationWSUSPolicy. Let’s start with the description of the server policy – ServerWSUSPolicy. 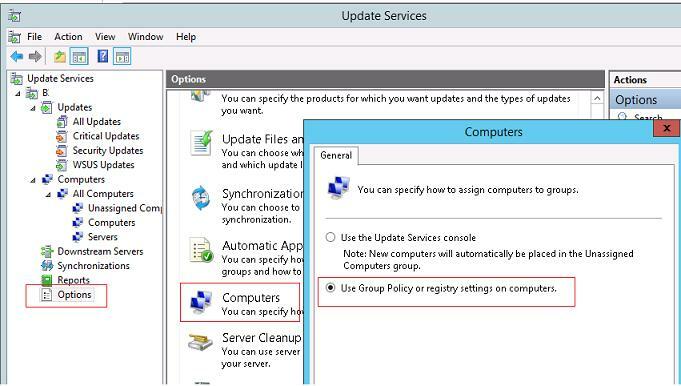 Group Policy settings that are responsible for the operation of the Windows Update service are located in the following GPO section: Computer Configuration -> Policies –> Administrative templates-> Windows Component-> Windows Update. Enable client-side targeting: Enable. Target group name for this computer: Servers – in the WSUS console, assign clients to the Servers group. Note. When you configure update policy, we recommend you to get acquainted with all the settings that are available in each option of Windows Update GPO section, and set the parameters suitable for your infrastructure and organization. We assume that in contrast to the server policy, updates to the client workstations are installed automatically at night immediately after receiving the updates. Computers should restart automatically after the installation of updates (notifying the user in 5 minutes). Specify Intranet Microsoft update service location: Enable. Set the intranet update service for detecting updates: http://hq-wsus.woshub.com:8530, Set the intranet statistics server: http://hq-wsus.woshub.com:8530 – is the address of the corporate WSUS server. In Windows 10 1607 and higher, despite the fact that you have specified to receive updates from the internal WSUS, Windows 10 may still try to access the Windows Update servers on the Internet. This “feature” is called Dual Scan. To disable receiving updates from the Internet, you need to additionally enable the policy Do not allow update deferral policies to cause scans against Windows Update (ref.). Tip. 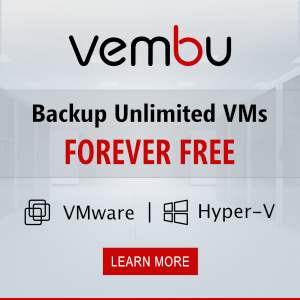 To let the computers in the company to have all available patches installed, both policies can be configured so that the update service (wuauserv) is forced to start on the client. To do it, under Computer Configuration -> Policies -> Windows Settings -> Security Settings -> System Services find Windows Update and set it to start automatically (Automatic). The next step is to assign the created policies to the corresponding Active Directory containers (OU). In our example OU structure is extremely simple: there are two containers – Servers (it contains all servers of the company, with the exception of the domain controllers) and WKS (Workstations – users’ computers). Tip. We consider only a fairly simple way of binding the WSUS policies to clients. In real world, it is possible to link a single WSUS policy to all domain computers (a GPO is assigned to the domain root), distribute different types of clients across different OUs (as in our example, we created different WSUS policies for servers and workstations). In large distributed domains it’s worth to link different WSUS servers to AD sites, or to assign a GPO based on the WMI filters, or even combine these methods. To assign the policy to the OU, click the correct OU in the Group Policy Management Console, select Link an Existing GPO, and then check the appropriate policy. Tip. Don’t forget about the separate OU – Domain Controllers. In most cases the WSUS Server policy should be linked to this container. You have to assign WorkstationWSUSPolicy to the AD container with the name WKS (where the Windows workstations are located) in the same way. 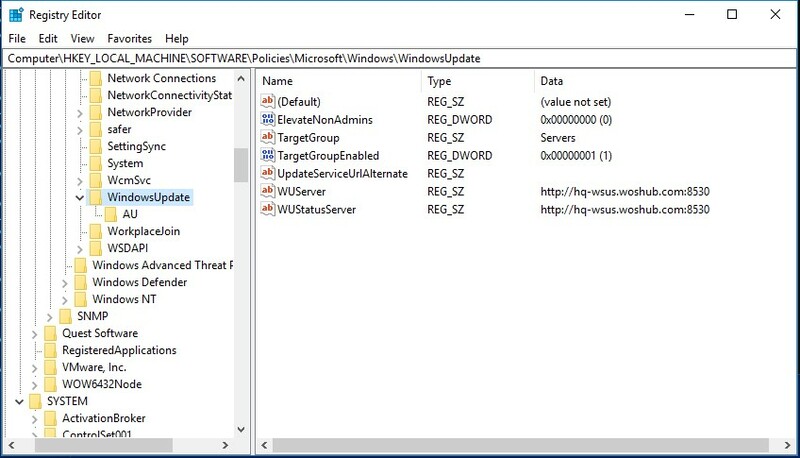 All Windows update settings that we have set via the group policies should appear on the client’s in registry key HKEY_LOCAL_MACHINE\SOFTWARE\Policies\Microsoft\Windows\WindowsUpdate. It is also convenient to control the applied WSUS settings on clients using the rsop.msc snap-in. In some time (it depends on the number of updates and bandwidth to the WSUS server) check if there is a pop-up notification of the new updates in the tray. Clients (the client’s name, an IP, an OS, patch percentage and the date of the last status update) should appear in the corresponding groups in the WSUS console. Since we assigned the computers and servers to the different WSUS groups using GPO, they will receive only the updates that are approved for installation on the corresponding WSUS groups. Note. If the updates don’t appear on the client, it’s recommended to carefully examine the Windows update service log (C:\Windows\WindowsUpdate.log). Please note that Windows 10 (Windows Server 2016) uses a different format of the WindowsUpdate.log file. The client downloads updates to the local folder C:\Windows\SoftwareDistribution\Download. In particularly difficult cases, you can try to fix the wuauserv service as follows. If an error 0x80244010 occurs when receiving updates on clients, try changing the frequency of checking for updates on the WSUS server using the Automatic Update detection frequency policy to 3-4 hours. In the next articles we’ll describe the peculiarities of the update approval on the WSUS server, and how to transfer approved updates between groups to a WSUS server using PowerShell.